for the problem verb varies. 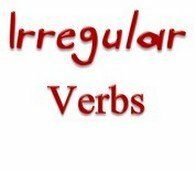 With a few simple changes to the irregular verbs, the writing passage sounds far better. The irregular verbs worksheet below has a useful chart which your students can have beside them as they write. The guide charts a number of common irregular past tense verbs and the different spelling requirements for instance, when the verb changes from simple past to past participle, etc.